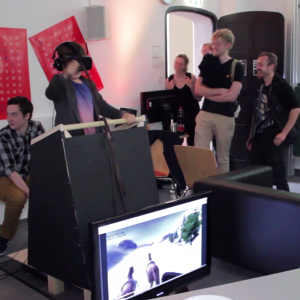 As part of the “Sensoria” project at the HAW Hamburg this prototype for a chariot simulator in VR was developed. A vibrating chariot and VR devices let players explore snowy landscapes and abysses. While the vibration makes the experience more immersive, it also minimizes motion sickness.